Before he goes, Simon Gaskell should reinstate John Allen, whom he unfairly dismissed. On the same day he announced retirement, Queen Mary complied with the order it received from the First-Tier Tribunal to release the data from a poorly-designed multimillion clinical trial. Patients with myalgic encephalomyelitis connected the two events, as they have been unhappy with the University’s costly attempt to block access to the results of the trial. Others, informed about the consecutive legal proceedings considering the unfair dismissals of Babis Magoulas, John Allen and my own, felt that these verdicts were behind Simon Gaskell’s haste to retire. Whatever the true reason for the step down is, Simon Gaskell will be remembered for breaking down previously existing College committees to enable a top-down management style, where whatever his appointed “senior executive” decided, was implemented; opposition was crashed and dissenters were silenced or fired. This embedded fear and cynicism into many, even those who were previously generous, critical and caring. Under his watch, millions were spent to legal fees, to senior executives (including himself) and their personal assistants, or ‘saved’ into College accounts; all this money nominally provided for academic purposes. Not to mention the decision to charge students 50% more than the true cost of their study. That this type of management of a public University is acceptable explains, in part, why the UK higher education sector is presently under such a crisis. The College should make every effort to recruit a Principal who understands and supports the academic mission of the institution. Another accountant in post, and there will be nothing left to associate Queen Mary with the University of London. This year Queen Mary University of London dropped 15 places in the Times Higher Education International University Rankings table (to 113)… so expect no announcements from the Principal (he will be around until summer 2017). As to his obligation to reinstate John Allen: Simon Gaskell has failed to behave like an honourable person would. No excuses accepted. Gaskell will be remembered as a liability to the College and to society as a whole. QMUL has named Lord Clement-Jones CBE as its next Chairman of Council, succeeding Sir Nicholas Montagu KCB, who completes his term as Chairman at the end of July 2017. Tim Clement-Jones is Managing Partner for London at DLA Piper and has been Chair of their China and Middle East Desks. He is well known in the political arena, serving as Chairman of the Liberal Party, when he played a major part in the merger with the Social Democratic Party, and as Treasurer of the Liberal Democrats. He speaks in the House of Lords on culture, media and sport. Tim has considerable non-executive experience, notably as Chairman of the School of Pharmacy between 2008 and 2012, and currently as a member of Council and Chair of the Audit and Risk Committee at UCL, from which he will step down with his appointment to QMUL. Tim impressed the selection committee with his enthusiasm for QMUL and his strong commitment to our values. My earlier messages told you about the process for appointing a successor to Simon Gaskell. This is to let you know that Council has now approved the appointment of Professor Colin Bailey as our new President and Principal. Colin is currently Deputy President and Deputy Vice-Chancellor, and Professor of Engineering, at the University of Manchester. I am absolutely delighted with the appointment – Colin is the ideal person to take Queen Mary on a continuing upward trajectory and build on Simon’s outstanding achievements. There was a very strong shortlist, and he was the unanimous choice of the interviewing panel, who also took account of comments from a discussion group (chaired by Philip Ogden) which included representatives of the Students’ Union, staff from all three Faculties and Professional Services, and the trade unions. Colin will take up his post, for five years in the first instance, on 1 September this year, the day after Simon retires. At Colin Bailey's open meeting with staff: "You are losing the support of your staff at such an early stage in your leadership." Council "failed" (filled with straymen of Sir Nicholas Montagu & Gaskell) last time. The opportunists who rose through the ranks to serve the new mission of the College (making surpluses for investors) have no motivation to change things. Thank you for the retweet. The same request should be now put to Colin Bailey. 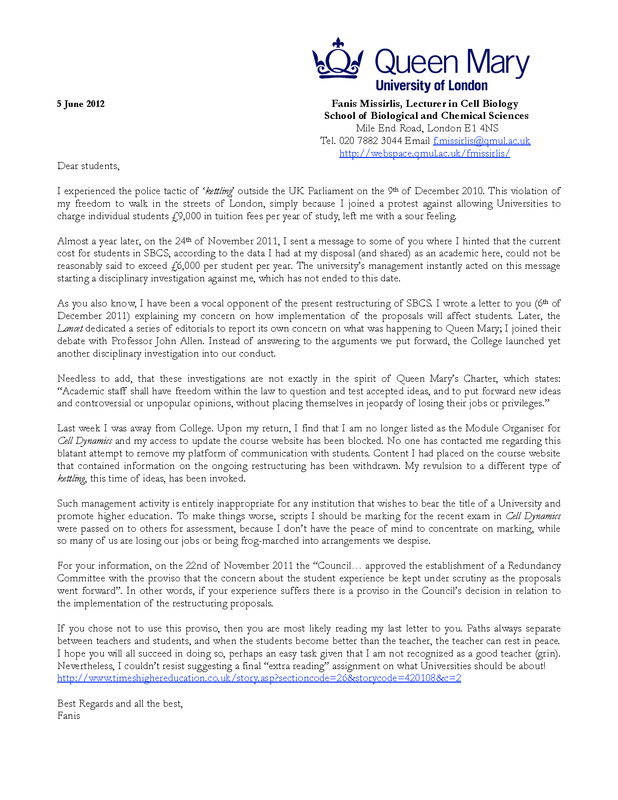 Or to the next Principal @QMUL to replace him if he continues to oppose academics & students at the university.